Thank you for taking the time to stop by my blog. I realize you could be doing so much with your time right now so I appreciate it. These drawings and doodles are small snapshots of life and thoughts that pass by me. I am a self taught “artist” that enjoys this life I’ve been given. I love nature, travel, adventure, music,food, learning and sports. I believe a good belly laugh cures most anything. Hey Brad- Just want to say I miss your regular posts. Hope all is well with you! Thanks for stopping by my blog, Brad! After scrolling a few minutes through yours, I found I just couldn’t stop. was it the fantastic drawings? The sweet or amusing messages? The delight of seeing places I have lived (Seattle, Midwest, etc)? Or just the fact that the cat was sitting on the scroll down button on my keyboard? Well, the cat hopped off about 20 minutes ago, and I kept scrolling. What a lovely blog! Thanks for sharing your work and thoughts with everyone. You’re talented!! Thanks for following…back at ya! Brad, I enjoyed your art. Very nice blog. You have won over a new follower. Whenever you have a moment please feel free to visit mine. Very nice. I think at some point everyone should have a pencil and some paper thrust into their hands so they can start exploring. For me, it’s evolved into a drawing tablet. Definitely will follow ur drawings. Nice art! Looking forward to seeing more. hi brad, thanks for stopping by my blog! i like your drawing style a lot. Very nice stuff, Brad, complex and intriguing. I like your style! I love your style of drawing! Very unique and entertaining. I really love your blog/site. Your work is very uplifting and entertaining. Thanks for stopping buy The White Swan. I love your drawing style, you have a great blog here. Loving your posts! Thanks for sharing!! Did you get my comment on your Salsa Garden picture? We are looking for a great cover photo for our school garden curriculum and I can’t get over how much I love your Salsa Garden drawing. Your work is great! Hi Brad, thanks for liking my latest Life Matters post, Paints, Palettes and Pathos. I was mesmerized with your drawings last night and couldn’t tear myself away to actually get to bed at a reasonable time! The detail, the verbal commentary, the humor and the drawings––love it all! Thank you, Julia, that made my day! As I’m sure you know, it’s a pleasure knowing you’re keeping people up for good reasons! Thank you! Nice blog Brad! love your drawings/doodles! 🙂 Quite inspirational – I like to do doodles between more serious pieces! Thank you! Thx for taking the time to comment! Thank you! The smile is all that matters! Hi Brad, just wanted to drop by to say, I enjoyed looking at your drawings and thanks to you, I’m feeling a little inspired to pick up my own pencil again! Thank you, and have fun drawing! Thank you, thanks for stopping by, and you absolutely should draw–I know you will inspire someone! amazing artist. I love your work! Hi Brad! I wanted to let you know I’ve nominated your blog for a One Lovely Blog Award – you can see the details here: http://backyardowl.com/2014/10/20/one-lovely-blog-award-my-15-blog-loves/. Your sketches and drawings are so fun, and clever, and slightly whimsical, and I really love seeing what you’ll come up with next. Keep up the great work! Love your blog, Brad! I’m following you for two reasons…to put a little lift in my day, and to inspire me to “doodle” more. I look forward to reading your posts. WoW! Thank you. Mission accomplished! Hi Brad! Thank you for liking our post The pot and the flowers. You have such a creative and humorous blog. Your talent is really God-given and your posts brought us much laughter. God bless you, your family and your lovely blog. Thank you! I receive that blessing and thank you for taking the time to stop by and read some! My hope is that it would be enjoyed. Thanks again! 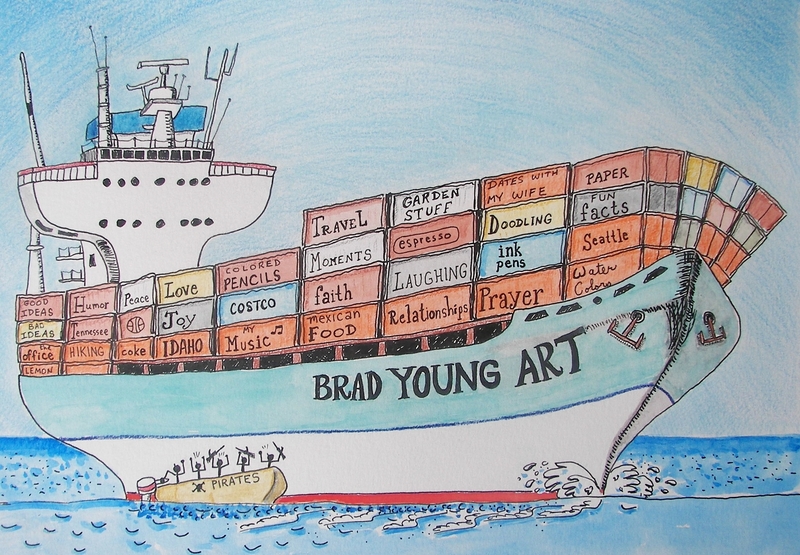 Hi Brad, I enjoyed looking at your drawings. Thanks for stopping by my site! Hey brad ! i love your blog …. your doodles and their themes are very cool ! Im an art student who loves travelling and music . Travel is my passion . Thank you! Keep fueling the passion! I love your doodle’s Brad! I just discovered you via WordPress’ post. You’ve inspired me to get doodling myself! Thank you! Can’t wait to see your stuff! Enjoy. Hi there! I loooooove your drawings! I hope you don’t mind me adding you to my blogroll! You are a very talented artist. I love you work! Enjoin and think when look at your drawing, joinfull in daily life. Thanks Brad. Lovely sidelong glances at life. I’ll be a regular visitor. Regards from Thom at the immortal jukebox (drop a nickel!). Yes – laughter, is a great cure for anything… congratulations on being featured… great illustrations.